Damak was changed to a municipality from a VDC (Village Development Committee) in the year 1990 AD. The Damak municipality consists of 1o wards,with previous 19 wards rearranged and some wards merged togethere as per population homogenity for wards. Damak also includes the large Himalayan Tea State (हिमालय गूडरिक) where the Ex-Royal Family has also invested. The municipality covers an area of 7,513 hectares and is at an average of 100 meters above the sea level. Lakhanpur in to the east, Urlabari, Rajghat and Madhumalla in the west and Chulachuli (Ilam) and Kohabhara VDC in the north and the south, respectively. According to the census of 2011, Damak had 7,178 households containing about 36,000 people. The total area is 7,513 hectares out of which 1406.7 hectares is covered by residential area whereas 5,586.30 hectares is used for agriculture. The market area consists of 400.00 hectares, 215 hectares as forest plant area and 265.00 hectares is used in other purposes. In 056/057 there was 1 Health post, 1 Hospital (AMDA) and 1 Nursing Home (Life Line) which contains 50 beds in total but now including AMDA and life line: there are 7 hospital they are AMDA-Nepal,Advance Health Care Centre, life line, om mechi, Q&Q hospital, Namaste Public Hospital, Janta National Hospital, damak hospital & research center. The Population Growth Rate is 5.14 per annum as per 2047/48 census. As per 056/057 census, there were about 88 industries, 1011 shops, 244 hotels and 9 financial institutions. Black topped road were 29 km, graveled roads were 150 km and earthen road were 500 km. In addition to it, the drainage runs 3.5 km through the main highway. There are 512 street lights and above 4000 telephone lines to public. Three Bhutanese Refugees camps (Beldangi 1, 2, and 3) were also settled in Damak in 1992. Victoria Cross Medal winner Rambahadur Limbu currently lives in Damak. It is one of the important trade center in eastern part of Nepal. There are many international organizations such as IOM, UNHCR, OX-FAM, LWF, NRCS, AMDA,CARITAS NEPAL etc. who are working for the refugees here in Damak. According to 2001 Nepal census, literacy rate of the city is 88%. Nepal Telecom Damak Branch serves as the center for Telecommunication and Cellular with two huge Skyline towers. Whereas Teliasonera AB's Ncell is also popular in the city having 82 small and One huge towers installed for fastest connectivity. 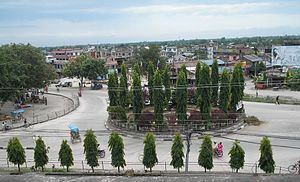 Damak has five FM stations named Radio Himshikhar(103.3Mhz), Star FM(92Mhz), Radio Jhapa (100.7Mhz), Saptarangi FM(101.6mHZ) and Pathibhara FM(93.6MHZ). But national radio station Radio Nepal and other surrounding FM stations Kanchanjungha FM, Saptakoshi FM, Koshi FM, Kantipur FM can clearly be heard in the city.Damak is also broadcasting the television channel named Himshikhar Television from the couple of years and running successfully in the region.